Hello summer, we've missed you! 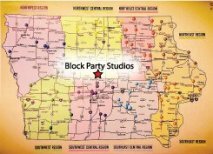 It was a busy month of May for us here at Block Party Studios, gearing up for Spring Market. We’d like to thank everyone who joined us in Minneapolis a few weeks ago, Dani always enjoys seeing familiar faces & Jolene finally got to put faces with names she talks to monthly! Thank you!! We have the “AISH” directory for sale for $5.oo and remember, Block Party Studios falls into the “South West” region please make sure to look for us there in your “AISH” directory. We are located at 1503 West K Ave., Nevada, IA 50201. We’re proud to say that this year we have a patriotic theme showcasing “Quilts of Valor” and “Honor Flight”. Thank you to all who have served our country, and to those who take time to honor them! All the “AISH” fabrics are in and waiting for you! So, come get your passport stamped, receive your free block, and buy your fabrics before they’re gone! Anyone have a collection of keep sake/souvenir pins or buttons? Wonder why you keep them because they’re stashed away somewhere? We have your solution! 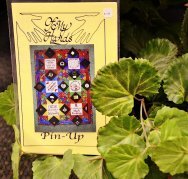 Check out this “Pin-Up”! “Things Quilters Really Think” collection and sells for $22.50. & bobbin always be full! Drive safely shop hopping & see you soon!